The more experienced reader used to shamanic journeys and having already established a good relation to his allies, can find in this section valuable and interesting hints for the practical applications and improvement of understanding shamanic lines of thought. Beginners are not target of this articles, however it is never a bad idea to read through them anyway. If you are only interested in shamanism in general or have just begun with the practice I recommend that you first get more experienced. You also should have mastered relevant technical aspects that I have collected in the section of practice. Here in this section about advanced ideas and techniques of applied shamanhood I introduce you to one very important shamanic tool, the shamanic garb. The shamanic headdress is prominent in this article. The article on divination techniques reflects on how you should create questions for, and meet the difficulties of an oracle and what an oracle is all about. 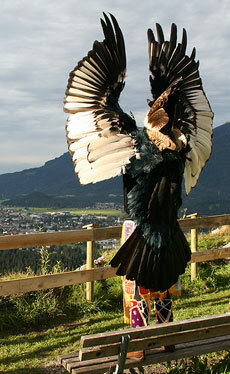 One very essential part of shamanism and lived shamanhood is the shamanic session. What is important in one such session, what can happen there and other details on it I am explaining here. Basic informations on how to conduct a shamanic session start this little sequel that is continued by the shamanic technique of extraction. Some informations on soul-loss that is rather common in western-styled societies you can read in another article. The death and the dying process, which are part of our life and main topics for shamanic oriented and spiritual people, have to be treated here, too, of course. However, my point of view is quite different to the opinion of the established church instances and of positivistic science. Our ancestors are related to us and thematically linked to the things happening in the time after life. Because they are important for shamanic practice I offer some thoughts on them, too. The last article is reflecting on the correct application and some backgrounds on offerings and sacrifices in shamanism.